Knowing one’s enemy is crucial to any successful battle plan. The Devil Is in the Details arms the reader with a study of Satan, the greatest enemy of God and man, which is both engaging and scriptural. strategies can be critically examined for one’s future defenses. 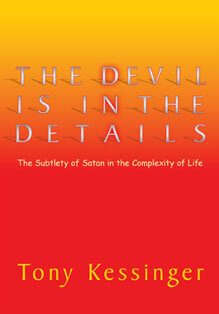 Beginning in the Garden of Eden and progressing through the Old and New Testaments, Tony Kessinger traces biblical allusions and references to Satan, his minions, and evil in general, in order to prove that Satan is alive, active, and even today has detailed plans to mislead and entrap humankind. Written in down-to-earth language with accessible biblical references, The Devil Is in the Details is as suitable for pastors, church leaders, and Sunday school teachers as it is for anyone interested in Bible study or learning more about Satan. Leading evangelical authors Tim LaHaye, Ed Hindson, Paul Benware, and Roy Zuck have all endorsed The Devil is in the Details as well as other ministry leaders.